The Mongol invasions of Iran in the early 13th century severely disrupted all economic activities in the region, including the pottery industry. Political stability was restored in the second half of the century with the establishment of the Mongol rulers of Iran (or Il-Khans). The links of the Il-Khans with the Great Khans of China fostered extensive contacts and trade across Asia. Pottery production in Iran fully resumed in the second half of the 13th century. The production of the period is characterized by new, robust vessel shapes, new patterns, and often somber colouring. This bowl typifies the new style, with its palette of white and black against a grey background. 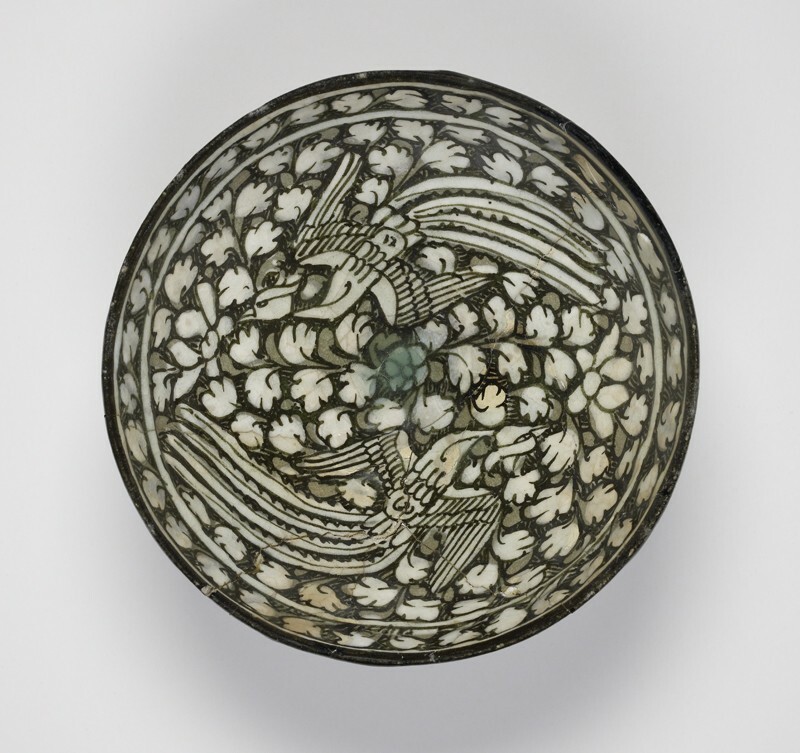 The phoenixes depicted in the interior of the bowl are one of the motifs of Far Eastern origin, which were introduced in the Middle East at this time. Probably inspired by textiles and other luxury goods imported from China during the Mongol period, they became part of the Islamic decorative repertoire in all media. 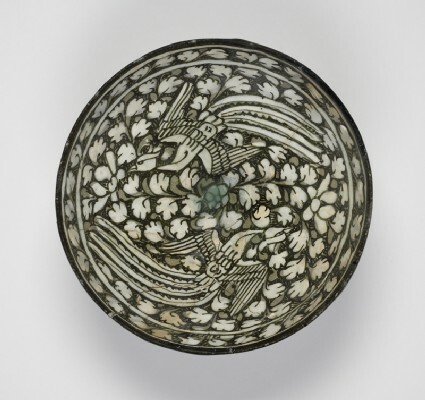 The Il-Khanid period saw the introduction into Persian art of a group of important decorative motifs derived from the Mongol east, including dragons, phoenixes, and lotus blossoms. The dragon traditionally represented the emperor, the phoenix, when used in the same context, the empress, while the lotus was an emblem much valued by both Mongol royalty and the court. Once introduced, however, the phoenixes and lotus blossoms in particular were swiftly adopted by potters as decorative motifs with only a more general symbolic reference. The lotus could be easily accommodated in the Islamic tradition of vegetal and floral motifs, while the phoenix was assimilated with a Persian mythical bird called the simurgh, well known to all Persians from its heroic role in the Shah-nameh, or ‘Book of Kings’, the legends of the exploits of the mythical kings of ancient Iran. The pottery of this period, wrongly named after Sultanabad in western Iran, displays three other novel elements: a generally grey tone, the shape of the bowl used, and its external decoration. Each of these is derived from ‘celadon’ wares, the Chinese green-glazed stonewares, huge quantities of which were imported into Iran by sea in the fourteenth century. The grey tone reflects the rather dour colour scheme of the imports; the shape follows the common celadon shape, with its narrow foot and flaring, rounded sides; the decorative panelling follows the lotus-petal moulding which appears on the outside of so many Chinese examples. Peter Morgan, Coloured Sultanabad wares in the Ashmolean Museum, Islamic Art in the Ashmolean Museum, Oxford Studies in Islamic Art Vol. X (forthcoming).